The team knows the full magnitude of this moment as well, and that fuels a heated exchange of words — and impassioned actions. 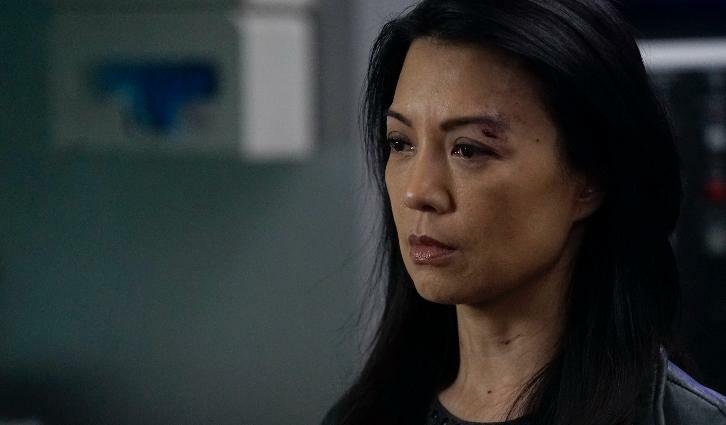 “The End” – Coulson’s life or death is the challenge the team finds themselves in, as the wrong decision will cause the destruction of Earth, in the spectacular season finale of “Marvel’s Agents of S.H.I.E.L.D.,” FRIDAY, MAY 18 (9:01-10:01 p.m. EDT), on The ABC Television Network, streaming and on demand. “Marvel’s Agents of S.H.I.E.L.D.” stars Clark Gregg as Agent Phil Coulson, Ming-Na Wen as Agent Melinda May, Chloe Bennet as Daisy Johnson, Iain De Caestecker as Agent Leo Fitz, Elizabeth Henstridge as Agent Jemma Simmons, Henry Simmons as Agent Alphonso “Mack” MacKenzie and Natalia Cordova-Buckley as Elena “Yo-Yo” Rodriguez. Guest starring are Adrian Pasdar as Glenn Talbot, Jeff Ward as Deke, Maximilian Osinski as Agent Davis, Briana Venskus as Agent Piper, Lola Glaudini as Polly Hinton, Lexy Kolker as Robin Hinton, Kurt Koehler as Officer Zbyszewski and Eva La Dare as Jan.
”The End” was written by Jed Whedon & Maurissa Tancharoen and directed by Jed Whedon. The season 5 finale of Agents of SHIELD will be titled "The End".